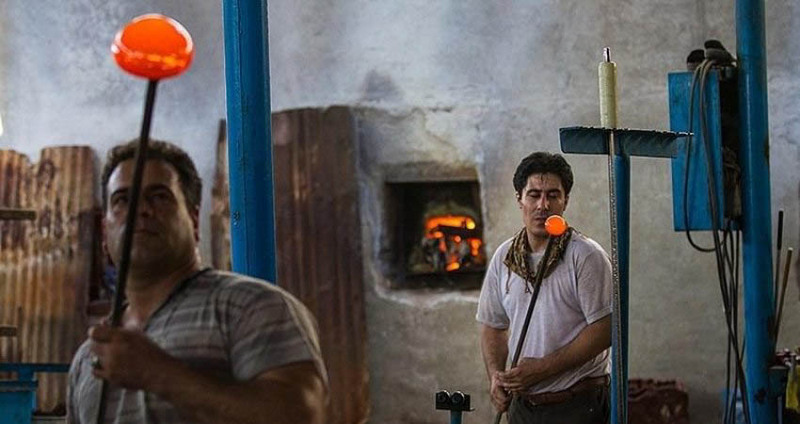 Glassblowing in Iran is a process of making different utensils and articles with melted material according to traditional methods including blowing and mold-blowing. Usually, there are two or more gas furnaces in glassblowing workshops for simultaneously use of several types of glass materials with different colors. These workshops prepared their supplies and raw material mainly from recycled and glass debris that have no other usage. The main ingredient of glass making is silica and sometimes is utilized in the process of Persian glassblowing. 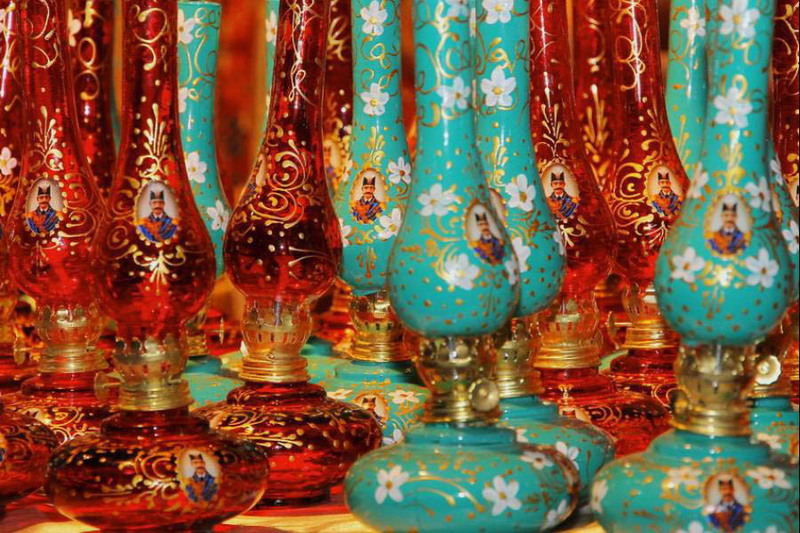 In the glassblowing technical terms, glassware that is made from raw material is called yek-atisheh and those made out of recycled glasses and debris are called dou-atisheh.In the blowing process, the tip of glass blowing pipe (dam) is pressed into the melted material and after some rotation, the adhered glass (bar) is pulled out. Glassblowers use the other side of the blowpipe to blow the bar. As a result, a small sphere is made which is called gooyeh-avval. When gooyeh-avval is cooled, the glassblower places the blowpipe in melted materials again and again picks up the required amount of material. The gooyeh-avval forms a base for the second layer of glass with the same thickness. Then, they place the blowpipe on a Y-shaped metal rod and, while turning it around, insert the blowpipe inside a wet semi-cylinder of wood (ghashogh). After doing this, glassblower blows through the blowpipe, as much as she/he likes, making a bigger sphere and then forms its tips with pliers. An assistant introduces another rod (vagireh), detaches the bar and holds it. After this stage, glassblower inserts the tip of vagireh into the mouth of furnace to heat up again and softens the loaded material in order to re-sharp it. If necessary, they attach a base, handle or any other decorations to the object. Another glassblower uses an additional rod to pick up some melted material from the furnace and while attaching them to the base, shapes them with pliers. In mold-blowing method, the melted material that was earlier placed on the tip of blowpipe is placed into a mold, which they blow through the blowpipe to take the desired form of the mold. There are also some methods for ornamentation of glassware. Some of them are applied during the production such as combination with metal, layering and colourful glass. Some are performed after the termination of glassblowing such as glass obscuring, painting on glass and glass scratching. Archeological studies and findings claim that, the date and history of this Persian art back to thirteenth century B.C. We do not know the name of old and ancient glassblowers, but we can name some contemporary masters such Khair-allah Elahi, Ali Baba Bakhtiari and Asad-allah Yousefi. Glassblowing is a traditional art mainly known and worked in Tehran. Nowadays, this art is practiced and performed in Qazvin and Tabriz.